“Thank you” – arguably one of the top two most polite expressions in any language. We’re taught from toddler-hood to say “thank you” when we’re given something (whether we asked for it or not). Thank you for the gift. Thank you for the meal. Thank you for the ride, the drink, the sock, the compliment. Thank you, from the bottom of my heart. We say “thank you” too much. I agree. It’s too much. So let’s get blunt and get it all on the table. 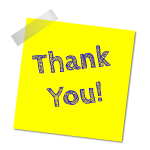 Saying “thank you” to a person who takes an action that benefits THEM – like signing up for your newsletter, or registering for a webinar, or downloading a document you’ve created – is a waste of space. See the difference? In this example, the original wording is just throw-away text, meaningless to the reader. The proposed wording is supportive, directional, and affirming – much more valuable to the reader. 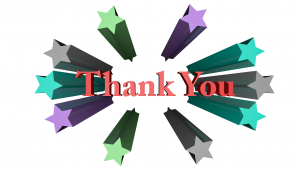 Saying “thank you” to a person who takes an action that benefits THEM – like signing up for your newsletter, or registering for a webinar, or downloading a document you’ve created – is a gift of power. This is a bit more subtle. When I went through a training program called “Advanced Sales Negotiation” many (MANY!) years ago, I was amazed to learn all the different ways that buyers and sellers accumulate and utilize power. Each of the powers has a name – the power of time spent, third-party-removed, and the power of options, to name a few. For example, if a buyer says “let’s meet” and the seller responds “I’m available any time,” the message being delivered is “I don’t have anything else to do.” Guess what? That gives 100% of the power to the buyer. The buyer may then turn that into a reason to ask for concessions, subtly understanding that if he’s the only buyer on the radar, the seller is no doubt desperate to make a sale. That’s the power of options in action. Let’s back up for a second. You’re offering things that have value to your perfect potential customers, right? Whether an event, a coupon, a newsletter, a document, cheatsheet, or checklist, whatever you’re offering is valuable to those who choose to receive it, right? When you thank people for choosing to receive what you’ve created for them, what are you actually saying to them? You’re saying “Oh my gosh, thank you for listening to me and believing me and picking me! I’m so grateful that you’ve chosen ME!” In other words, you’ve actually set the tone that the entire conversation going forward is going to be all about you and your needs. Suddenly the action they’ve just taken is all about YOU, not them. See? And, because it’s all about YOU, your buyer – your perfect potential customer – has the power. Put another way: if your message is stated in these terms: “Please give me your email address so I can market to you,” then by all means, express gratitude to anyone who chooses to give you their email address. But, if your message is, in one form or another, “Here’s something that might be of value to you,” then I encourage you to affirm their choice, not thank them for making it. Because, when you say “thank you for requesting” or “thank you for registering” or “thank you for signing up,” you are unintentionally telling your potential buyer that you need them. And, while we all know you DO need them, the point is the value that you are providing to them, and that’s where you want to keep the focus – so you don’t lose your power. You are (or your organization is) an authority in your subject matter, whatever it may be. Whether you’re marketing on behalf of an energy analyst firm or a musical instrument store, or if you’re a golf coach or a fitness guru, your knowledge and authority are why people listen to what you have to say. 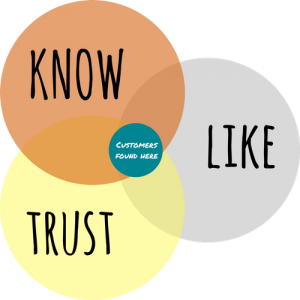 To build your know-like-trust factor, you want to express yourself authoritatively while remaining humble and engendering trust. One of the ways to be authoritative is to acknowledge the people who choose to communicate with you in very positive terms, affirming their action while expressing your own commitment to them. “I’m so glad you’ll be joining us. You’ll leave with 3 new ideas you can put into practice right away.” That’s so much more powerful than “Thank you for registering to attend our webinar,” don’t you think? Don’t those feel more authoritative than “thank you for setting a meeting with me”? Simply be conscious of when you say thanks. Are you thanking people for their contributions to YOUR life, or thanking them for taking you up on your offer to contribute to theirs? Think about when your gratitude is unnecessary and whether it will contribute to or detract from the relationship you want to build with your potential customer. Don’t give away power when you don’t need to (even if you’re secure that it won’t be exercised against you), and don’t waste space with namby-pamby sentiments that don’t affirm your authority in your subject. Stay true to your voice. Use every word wisely. ‘Thank you’ for posting this.